Fragrance families are a way to classify individual fragrances into groups based on their olfactory characteristics. These classifications are to help people find fragrances they might like, even when they may not be able to smell the fragrance; you know what smells you like. 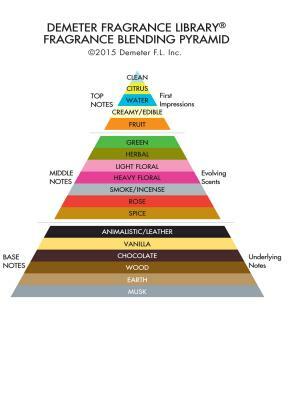 At Demeter, we have created our own fragrance categories in familiar, understandable language; no jargon here, so you can easily understand which categories of smells appeal to you. And fragrances within the same category will almost always blend well together. We have also divided those categories into Top, Middle and Base note groupings. These groupings help indicate (relatively) how long different fragrances are likely to last on the skin, and are handy to understand when blending more complex fragrances.